The Berkeley Language Institute , in partnership with the Northern California Translators Association (NCTA) is hosting a workshop comparing the certification processes for national medical interpreters. It is held on Saturday, March 29, 2014 from 1 – 4:14 pm at the Berkeley Language Institute (1840 Alcatraz Ave. Suite C-1B, Berkeley, CA 94703). For details and to register, please click here. The bay area has a multitude of bilingual schools to offer, in a wide range of languages. Some languages include Chinese (Cantonese & Mandarin), Farsi, French, German, Russian and Spanish. 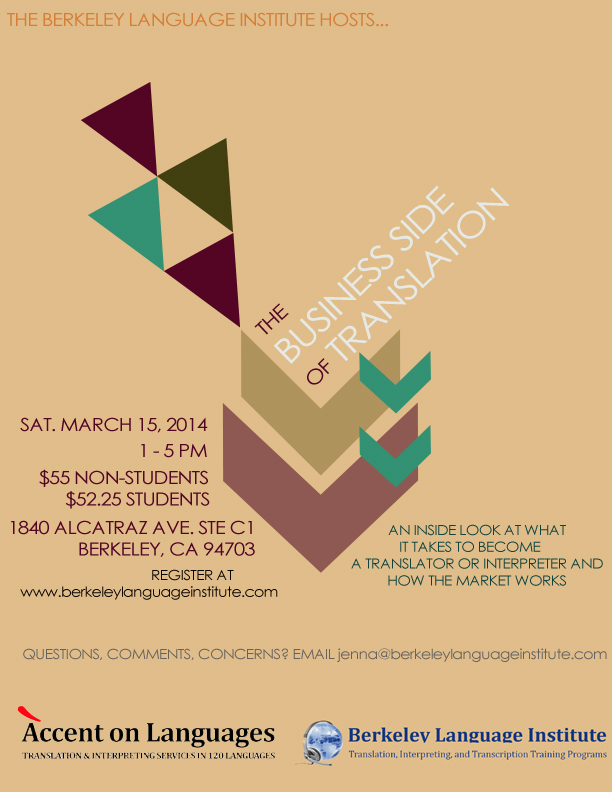 The Berkeley Language Institute is offering a 4-hour introductory course about the translation/interpretation industry. Terminology: translator, transcriber, consecutive and simultaneous interpreter, voice talent, etc. This seminar, conducted in English, applies to anyone interested in becoming a professional translator and/or interpreter. Sign up now on our registration page to guarantee your seat in this course. Registration is open until March 12th, 2014.